Speakers at the School-Business Partnerships of Long Island, Inc.'s Annual Fred Breithut Scholarship Breakfast smile after awarding the four-year scholarship on February 26 at Farmingdale State College. 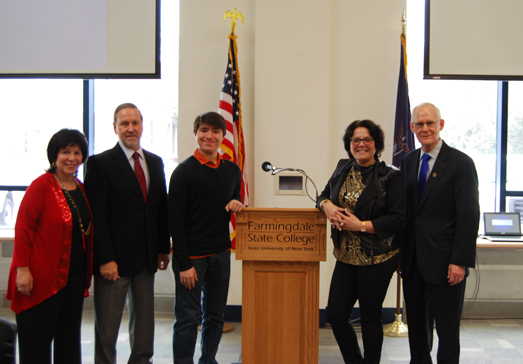 From left to right: Joani Madarash, Executive Director, SBPLI, Inc.; Gordon Canary, District Office Manager, New York State Senator Phil Boyle's office; Adam Lopez, scholarship winner and first-year Farmingdale State College student; Dr. Lorraine Greenwald, Dean of International Education and Programs at Farmingdale State College; and Dr. Hubert Keen, President, Farmingdale State College. On February 26, School-Business Partnerships of Long Island, Inc. (SBPLI), along with Farmingdale State College, presented its annual Fred Breithut Scholarship Breakfast Fundraiser at the college's Campus Center. The admission suggested a donation of $30 that went towards the scholarship, which was awarded to Adam Lopez, Farmingdale State College Freshman, and a graduate of Longwood High School. At the event, guests enjoyed breakfast while listening to speakers, such as Joani Madarash, Executive Director, SBPLI; Dr. Hubert Keen, President of Farmingdale State College; Dr. Henry Sikorski, Chief Development Officer, Farmingdale State College; Dr. Lorraine Greenwald, Dean of International Education and Programs, Farmingdale State College; and Gordon Canary, District Office Manager, New York State Senator Phil Boyle's office. When Mr. Lopez approached the podium, he expressed his gratitude for the scholarship and explained his passion for engineering and business, which led him to double major in Mechanical Engineering Technology and Business. The scholarship, which was created in 2009, in honor of Fred Breithut, Founder of SBPLI, is awarded to an incoming Farmingdale State College student who has participated in SBPLI's FIRST (For Inspiration and Recognition of Science and Technology) Robotics programs and meets the eligibility requirements for the scholarship. The student receives $1,000 for each semester he/she attends the college (maximum of eight semesters). Mr. Breithut sadly passed away in 2010, and it has become even more important for SBPLI to keep this scholarship intact due to his love and admiration for students. The scholarship truly represents what Mr. Breithut supported: to further the education of the youth on Long Island. "We are thrilled to award this scholarship to Adam Lopez," says Ms. Madarash. "He has dedicated a great deal of his time to SBPLI programs and has learned so much. We are confident that he will succeed throughout his four-years at Farmingdale State College. Each year, we hope to change a student's life with the Fred Breithut Scholarship."